Looking for "Modern Family" Auditions and Casting Calls? Post your profile, photos, resume and videos so you can be discovered by casting directors and talent scouts around the world. You might even get a chance to appear on a TV show like "Modern Family." ABC's hit comedy, "Modern Family," returns for its second season already the recipient of a Peabody Award, Writers Guild Awards, Directors Guilds Awards, Television Critics Award and six Emmy Awards, including for Outstanding Comedy Series. It seems that today's families have embraced this particular modern family, which is anything but cookie cutter and is just as honest and complex as their own. The Pritchett clan has Jay sitting at the head, a true guys' guy experiencing a bit of mid-life crisis, has remarried a much younger wife, Gloria, whose passion and loyalty is matched by her 11-year-old son, Manny, a boy wise beyond his years. Blending together into this new family has quite the learning curve with some culture clashes, a few awkward misunderstandings, and plenty of sweet victories along the way. Jay's grown daughter, Claire, has her own family. Claire and Phil are the proud parents of three kids with whom they want that open, healthy, honest relationship. It's not always easy, especially when you have a teenage daughter who's growing up a little fast, a too-smart-for-her-own-good middle daughter and a scatterbrained boy. On top of that, Phil wants to be the "cool dad," while Claire is just trying her best to run a tight ship, determined not to let her kids have the rebellious childhood she had. Claire's brother and Jay's grown son, Mitchell, adopted a Vietnamese baby with his partner of five years, Cameron. Opposites attract in this household, with Cameron having a wonderfully big personality and maybe a flare for the dramatic, whereas Mitchell is the more serious of the two. They balance each other out and are doting fathers trying to do their best as new parents. "Modern Family" stars Ed O'Neill as Jay, Julie Bowen as Claire, Ty Burrell as Phil, Sof�a Vergara as Gloria, Jesse Tyler Ferguson as Mitchell, Eric Stonestreet as Cameron, Sarah Hyland as Haley, Nolan Gould as Luke, Ariel Winter as Alex and Rico Rodriguez as Manny. Welcome to the "Modern Family" Message Board - the place to discuss anything and everything about "Modern Family." Hi, my name is Presley Cruz. I am almost 13 years old. I have big brown eyes, I'm a brunette, and I'm Caucassion/Latino.My height is 5'0" .I have trained in John Casablancas so I know how to act and model. Thats a little about my work. But about the show...WOW it is one of my favorites!!! Modern Family has the most HILARIOUS stuff. Good job:)...Please email me if you would like to audition me :) I will say yes to anything! Hi, I'm Carol Wu. I cannot believe that not so many people want to be an extra or part of Modern Family. This show is hilarious! I'd love to be a part of it as an extra. Hi, I'm Manuel, I'm 23 and I'm colombian, I would love to be in the show, I think I could be Gloria's little brother or some like that, love the show, hope to see many seasons of it. My name is Bekkie Roberts. I live in Surrey in England. I'm 15, only 5'1'' high, have brown eyes and brown curly hair. I have been told I have similar precense as Cam! I would love to play his English niece or something... that would be cool! Hi I am Marissa Finlay I am a mix of Italian and Irish I have Brown hair and brown eyes and I would love to be in modern family even as an extra. If I would hve a talking part I would be soooo happy because the lines in Modern family are very halarious and awesome! Hey! Im Kristina Gaumntiz and well, i am just starting out in acting, i sing. and im 5.2 or 5.3. Brown hair, Brown Eyes, and im Caucasian. I would love to be a extra in Modern Family so i can start out my acting carrer! Thank you! Hi! I'm Ali Martini. I'm19, 5'7" and I have long red hair and green eyes. I would love to be part of the show! I'm up for any part that's open! Please email me! I love the show. It makes me happy everytime I watch it. I'm so looking forward to the next season! Hope to hear from you. Thanks! Hello, I'm Addlyn Teague. I am 5'1'', have dirty blonde hair and blue eyes and also caucasian. I love Modern Family!!! I watch it every Wednesday night! I would love to be a part of it if you would consider having me! It would be a marvelous chance to have my acting debut start out on Modern Family!!! I hope to hear from you in the mere future!!! Thank You! I'm Robert.I know how to sing and act a little.When I haven't shaved in a while people say I look like a grown man even though I'm 18. When my face is shaved they say I look like a young bartender(I am a bartender).so I would love to play a young bartender part.If you think I have the right face for another part that would be cool too.So let me know when you need someone. Hi my name is Gisell Hernandez i am a really Great acttress and singer will am ok on singing am latina and i have black hair with brown highlights am reallly nice and outgoing i can reallly just act to anything if i put my best work which i do all the time will am only in 6th grade and ready to take anything that comes to my way am not a mean person i get along with everyone but am sometimes shy if you want to meet me or just talk for the part you have just email me. pretty please with a cherry on top( i really dont say that alot hahaha) but i really do hope you pick me if you want too thanks for reading my message. I currently work for the schools as a Board Secretary during the day, and I am lead singer in the Rhythm Nation Band by night. I am a hispanic female, 39, 5' 7" and I would love to play Gloria's sister. Her character is so crazy, and I thought I was the only one. I would really love a chance to start an acting career. It's never too late, or so they tell me. blue eyes. I live in Southern California. I'm a musician but also I would love to act. I perform all the time and I do auditions to get on different instruments, so I know how it works. 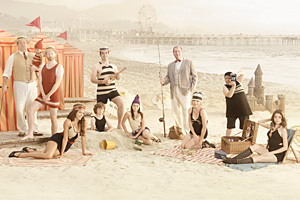 I love the show Modern Family, it's one of my favorite shows, and I would love to be on it as an extra or something. It looks like a fun group of people to work with! My favorite character is Mitchell (Jesse Tyler Ferguson), I would love to some how be associated with him and Cameron (Eric Stonestreet). Hi!! I watch modern family every week and its my favorite show ever! I am brunette, 5"1, hazel eyes, and Caucasian. It is my dream to be on modern family! Please consider me to be part of this marvelous show! Thank you so much! Hello, I'm Imari. I'm Jamaican, and I'm 5'6. And I love Modern Family, it makes me laugh a great deal. I have always loved acting. I can also, cry on cue. I live in California. I would be a dream to be on this show. So, if your interested please feel free to contact me. hi im robyn, i love modern family and im really comodey smart. i have brown hair and i am kenyan and asian cool mix of you want to hire me im also 4'11 especially my beauty so friend me. I am African Canadian and would love to play a role in the show. Hello my name is Joe Tran. I'm an Asian American all the way from Texas. I wish to bring a little bit more of diversity into the show. I'm 19 years old but like Sarah Hyland, I maybe old but have a look of a 16 year old teenager. I want to be in the show for a couple if reasons. I'm in college and looking for an opportunity to be in a show like this. My height is 5'6 but not as muscular. That's all you need to know so far. Hi I'm maria givonna petrella Ive never had experience but Ive study the ways of modeling, singing and acting so basically Ive tried them all and i think I'm all good but yeah i wanna pump the show more make it terrific. I'm in yr 8 age 13 and Ive got what it takes to go and act as someone I'm not! so please if you do wanna take me on trial then message me for my number PS my fantasy is to be famous and you help me out then if i become fame i would give you equator of the money i make for a year! besides the money i would make half would go to children's hospital and the poor and other half my family! Hello! I'm 15 years old and i came from france but if you give me an audition i can come in america. I have no experience but i play characters at my school and when i play a character i become this character i'm 100% in my role i can play all the characters that you want and become an actor it's my dream since i was young(but play in modern family it would be awesome) so i hope that you can help me and give me the opportunity to realise my dream! Hello! im 13 years old and i live in australia. i have some experience in acting and can play any kind of character you want me to. it has been my dream to become an actor and im a big fan of modern family. i hope that you will reconise my talent and assign me as an extra or even part of the show. I was born on the second of febuary 1998 and all though it would be preety hard for me to get over to america i would still love to be on the show. Hi, my name is Cameron and I'm a professional actor. I just finished filming an independent film in Pittsburgh. I love this show so much, and I'd love to be cast in a supporting role. I'm 5'7 and have brown hair and blue eyes. Please email me if you'd like me for the show. I can send my resume and headshot. Thanks! Good luck with the show! It's awesome! I love it! Where do we find out information about auditioning for the role of Lily, I don't see any info on the ABC website. Thank you. where can we find info for auditioning for lily, my daughter is 3 and she's a real lil' lily lookalike. where can i send her pics? I'm also looking for information for the auditions for Lily for my 3yo. I have a 3 year old daughter that would be perfect for role as Lily. Is there any information on auditions? hey im tyler ford and im almost 14 have really blue eyes and dirty-blonde/brown hair. im 5'3 and i love acting. im easly coachable and can do the stanky leg and other usher like dance moves. i am a really good actor for a reality/family kind of show. i can play kids younger than me because im only about 90 pounds. i really hope you consider me for any part. i am also a huge fan of this show and really really hope you would consider me. thank you bye. Hello I'm Cris Olvera I'm from Corpus Christi, TX and I'm 13 years old, Rico Rodriguez is my idol and I've always dreamed of doing the show modern family. I have done past musicals such as Bugsy Malone, Aladdin Jr., and mulan Jr. At the Harbor Playhouse. I'm 5.2 ft, fluffy, Black hair, brown eye's, and straight teeth. I will consider any part. If you want to contact me. Thank you. Hi! My name is Caitlyn Davis! D am in 10th grade and I have blonde hair and grey blue eyes. I am in LOVE with this show. I have watched almost every episode. I do both plays and musicals within my school and youth program. I have been doing this since I was in 3rd grade so i am comfortable under pressure and in front of a large audience. If i could please just send you my head shot, or get an audition for an extra it would be amazing Thank you! hi im naudia. i am almost 15(sep. 22, 96) i love ur show i would just love to be on it. my dream is to be an actress. i have acting experience and i was a contract winner in the american mall model search, but i didnt get my pictures in on time. i am usually a presistant person though. thius show is so funny and i would love an opportunity to be on it. hey if u need another actress i'm glad to help i'm a fast leaner. Hey! my name is Veronica I'm 14 years old, i am 4'9'', i have big brown eyes, acne free skin, olive skin, dark brown curly hair. i love acting and do a drama class every week at school. and i watch modern family every week. i have all the episodes at home. everyone tells me all the time that i look alot like Sarah Hyland and i should audition to be on modern family. So now i am. i don't have alot of experience with acting but I'd love to start of by being an extra. please give me the chance. Hey! my name is Veronica I'm 14 years old, i am 4'9'', i have big brown eyes, acne free skin, olive skin, dark brown curly hair and im egyptian. i love acting and do a drama class every week at school. and i watch modern family every week. i have all the episodes at home. everyone tells me all the time that i look alot like Sarah Hyland and i should audition to be on modern family. So now i am. i don't have alot of experience with acting but I'd love to start of by being an extra. even though and it would be ahrd to travel to america....i'd love the chance to be on the show. Hi, my name is Angela Kim. I'm a 16 year old Asian American girl. I live in Michigan and am 5'3 and I suppose average looking. Modern Family is by far one of my favorite shows, it's so funny and I've always wanted to be a part of it. I have a lot of acting experience and have been told I have a good sense of humor. I feel like I would really fit in with the cast, and if not at least I could make everyone else look better? I am your not-so-typical awkward teenager, and would be extremely grateful if you contacted me for any type of role. Hope I don't sound too desperate ... I would just really love to experience this ! Hi. My name is Inge and I'm 16 years old from South Africa. I have blonde-light brown hair, green-blue eyes, a normal white skinned tan, 5.4 ft and I'm quite petite. (I could pass off from being 12 years old or older if I had to). I would love to be part of modern family. Its full of humour and I cry of laughter every time I watch an episode. I'm not a shy person and I'm always making my friends and family laugh. I work well under pressure and I also play piano and the bass guitar. Any role will do :) I'm not picky at all - I just want an opportunity to be part of this amazing show. Thanks for taking your time to read this! Hey, my name is Emma. I am almost 15 and and 5'5''. I am also a little chubby. I am an american expat and my family and I love this show. If you ever need a extra i would love the chance. hi, my name is maria. i am 14 years old and i am 5'3". i am mixed: African-American, Hispanic, and Irish (i know weird combination). i have brown hair, with light brown eyes and a Carmel skin complexion. i love modern family and would like to participate in it if i ever get the chance. think.. i know its a great show and i want to be a part of it. i love acting, it gives me a chance to make people smile and laugh which is what i live for.i don't have any TV experience but i do have lot of practice at school and places at my environment.thank you for reading and considering. bye!!! Hey! I'm Nick McGlinch. I'm a Caucasian American, almost 20 years old, with short blonde hair, 135 pounds, about 5'9" and I work out a bit. I can sing, play guitar and drums. (all quite well, played drums for 13 years and guitar for 11. Been singing as long as I've been playing guitar.) I don't have much professional acting experience, but I've acted in movies that my friends in film school have made for their class projects. I've also been included in the script writing process and what not (mostly comedy, some drama-type stuff.) So I've got an understanding of how scripts writing and reading works. I love the show and would love even more to be on it! I could do anything from being an extra, to being long term. Let me know! Thanks! Hi I'm Ellen and I'm an Asian 15 year old girl. The young Lily reminds me a lot of myself when I was younger because I looked similar to her. I know I could play the older Lily in future episodes very well. hi i'm rachael and i'm 14 years old and i'm a pretty girl. i would love to be on the show as my dream job is to become an actress so please let me on the show. hey i'm Emma and i'm 14 years old and i'm from Australia. i would love being on modern family because it's a great show. i honestly don't have much acting experience but i can learn and i do pick things up really easily. i really want to be an actress and i love your show :) please let me be on your TV series. Hi! My name is Hannah, I am 13 years old and I don't have much acting experience...yet. I have been in many skits/school plays. I am said to be really funny, and my friends, (myself included) think I would be great on the show. I am good with on the spot sorta things, and I just love making others laugh. Though I might come off sort of shy, I am full of life and have a creative sense of humor. Look-wise: Blondish/brown hair, bluish/grayish eyes, no braces and light ,NOT pale skin and 5'3 or 5'4...it sorta varies. But, I freaking love Modern Family and I would be honored to be on the show! Hi, my name is Eugene, I am 20 years old African American, I've done a bit of acting, and I'm currently working on my own youtube page. I currently live in Maryland. Modern family is such an amazing show, I'm 5'8. I would love to be an extra on this show. I'm also a photography student so I'm very good with light and crew work. thank you for your time. my name is Jacob wood i am from Maryland I'm 6'5 tall 235lbs i have been trying to break out in acting and i don't know where to start i really would love to be on the show i am a huge fan and i think it would be a wonderful start please respond. Hello, My name is Jimena Hernandez. I live in the United States,15 years old, I'm 5'2, Latina, and I absolutely love to act. Every moment on stage I try and live it with all my soul. I'd love to be an extra or anything, I only do acting because I have a huge passion for it. I have been in school plays and had a role in one of them. If you ever need a extra for Modern Family or any other show, please feel free to contact me. Thank you! I love the show!! I am 13 years old and think I could be Rico's brother! Hope you consider me!! Hi, my name is Pamela. I live in the United States, Latina, I'm 5'2 & I would love to start acting in this show, I love it a lot, I hope to be one of the extras or anything, If you have any auditions for me contact me, Thank you so much! hi, my name is Shaun Lowe and i live in the UK. I am 15 years of age but look around 13. I have brown hair and brown eyes, i am 5 ft 6 and am willing to do some acting in the states. My acting experience comes from theater where I spent two years performing on stage. Hi! My name is Christina, I am 14 years old, but i look 15-16. I have brown hair and hazel eyes. I am about 5' 7''. I know that my height isn't normally a "good acting" height, but I have a lot of experience. I have acted professionally for Artists and Directors in Milwaukee and I attend a 2-3 week acting camp at a highly know acting school in Milwaukee. I'm a hard worker and a Great performer. Call me for any questions or info! I'd love to act with you guys! Plus, My dad know one of the producers, if the helps anything. :) Thanks so Much!! Hi! My name is Christina. I am 14 but I look 15-16. I have brown hair and hazel eyes. My height is 5'7''. I know that my height isn't a normally "acting height", but I have acted professionally for some artists and directors but nothing as big as TV. I would love to break into the business! Also, every year I attend a highly know acting school in Milwaukee for 2-3 weeks. So I have experience. I'm a hard worker, a fast learner and I'm a great performer. E-mail me if you're interested or have any questions! Plus, if it helps, my dad knows one of the producers :) Thanks again! My name is Charlotte. I have light olive skin, brown long hair and brown eyes. I only speak English and I am Asian and quarter European. I would love to be in a role as a newly adopted child in Cameron's and Mitchell's family, but I'd be happy to receive any other role. I don't have any acting training. I can sing but not professionally. Thank you for any consideration and I hope you keep me in mind. I have a personal email but if you would like my parent's I'd be more than happy to let you know. Thanks again. hey im Zoe i live in Australia im 15 yrs old, i have hazel brown eyes and dark brown hair. i LOVE! modern family. i've done dancing and acting in school and outside of school, my dream is to be on modern family i would love the chance to meet you guys and work with the cast. i hope i stand out because i will do anything to get that chance. thank you soo much! One thing I think should be definitely considered as a part of the Modern Family cast is... ME! My name is Annika Hsu, and I'm a 15 year old who's a proud Taiwanese, but a girl who grew up in sunny California. I'm only around 5 feet, so from an acting standpoint, I would definitely have to play someone younger than my age. I have a small face, dark brown hair parted from the right, and dark brown eyes that light up with joy when I laugh. Because I am both Asian and Asian in appearance, I think it'd be a great idea for me to play an older version of Lily, in future episodes or seasons. I have a lot of experience in dancing, acting, music, and art. I have performed with the SSCAC ballet theater, and multiple acting roles in various shows. I am funny and I love to have a good laugh with my friends. I am a serious contender for this or any job, and I would greatly appreciate it if I was given an opportunity. Thank you for hearing me out. Hello to the greatest show on television! My name is Jonathan Ratcliff, and I am an aspiring model/actor a student at the University of Texas. I have a tall and fit build at 6'4. My hispanic (puerto rican) roots allow me to obtain the tall/dark/handsome look and I have done parts in big movies and commercials. I would absolutely love to contribute in any way of the show. If anything opens up and you would like to see my resume/photos, please email me! I hope you guys will consider my offer! Thank you! I have done many live theater shows and I believe I am ready for a challenge! A Perminet part I would love buy I know it's a lot to ask even to get chosen for a audition. I can send photos of me if you just contact me. Being a actor in modern family is my dream and I will grab any chance I have. If you have any auditions at all please contact me as soon as you can.